Sorry for the quality of the image. But I took a couple of photos this evening at 8pm with my mobile while watering the garden. It was hard to capture and this is the best of a not so good bunch. However, you can see that the little native pollinator with the blue striped abdomen is out foraging. It hung around this bush for a good 15 minutes. I would love to stumble on its hive to observe the differences, if any, between this smaller, rounder bee, compared to the honey bees in my backyard. I have a friend who sees them in her garden as well. We are in the Ashburton/Glen Iris area. Has anyone else seen native bees or a native hive in Melbourne or its surrounds? 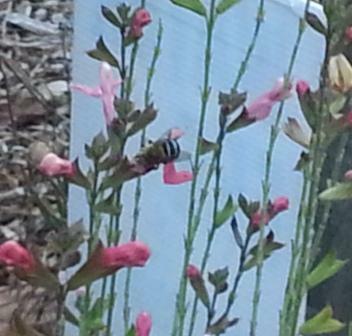 I often saw those blue banded bees hanging around the garden when I lived in Adelaide. If I recall correctly, they are a solitary bee which burrow into wood. They're excellent for pollinating tomatoes and other solanums because they like to do "buzz pollination", honey bees not being very effective for this. They've been researched for use in tomato greenhouses as a substitute for hand pollination which is required due to the lack of wind. One native bee I often see around Melbourne is a small 5-10mm long bee which build their hives as burrows into hard soil. I haven't found any information about this bee yet. this is the native blue banded bee. It does not live ina hive but individual burrows in clay banks / retaining walls / the ground. often many will burrow - nest in the same location. I see these around quite a bit, they are usually on blue or purple flowers interestingly. Apparently a bit of research is going into these guys as crop pollinators for inclement weather periods as they tolerate crappier weather conditions than European honey bees can.